Orgyenpa was born in Latö, in Northern Tibet, in the year of Earth Tiger, to a family of tantric practioners. At an early age, he mastered Vajrakilaya and other teachings and practices of his father’s lineage. He was naturally inclined to meditation practices but decided that he should first study philosophy before beginning serious meditation practice. He was ordained as upasaka by Lord Götsangpa. From the age of seven, he applied himself to basic studies. When he was sixteen, he started studying various philosophical texts such as Abhidharma, Madhyamaka, Vinaya, and other topics of sciences at a monastery in Tsang province, which was famous for the quality of its teaching. He excelled among his contemporaries and mastered all subjects. He also received and practiced the Kalachakra tantra in full from Golungpa Namkha Gyaltsen and later clarified those teachings further with Lord Götsangpa. He traveled to Nepal, India, China, Pakistan, Tsari, Mount Kailash, Jalandara, and Odiyana to learn and practice further at these sacred places. He achieved great accomplishments in his practice and became a realized tantric master. At fifty-three, he met the Second Karmapa, Karma Pakshi, and received the full Kagyu lineage teachings and transmissions. After he received the key instructions, he attained high realization and they became inseparable. Orgyenpa’s activities of benefiting beings flourished throughout Tibet and he focused mainly instructing disciples through Gampopa’s tradition of Mahamudra teachings. Among countless students, he had four renowned sons — two brothers of Nyedowa, Chöje Kharchuwa of Yazang, and Jamyang Sönam Öser of Langkhor; as well as eight close sons, four supreme ones, and many other scholars and yogis of Tibet and India. 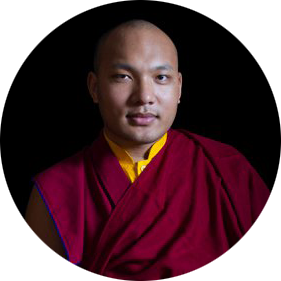 However, his main disciple and lineage holder was the Third Karmapa, Rangjung Dorje. These details about are compiled from Pawo Tsuklak Trengwa’s Feast For Scholars (chos ‘byung mkhas pa’i dg’a ston), Beijing edition, vol. 2, pp. 913-918. May this be virtuous!